Greetings from EYEWITNESS IN SALCHESTER - well, how does that sound? If certain local councillors have their way, that'll be the name of a new cosmopolitan city centre stretching from Ardwick to Pendleton. Councillor Jim Young has produced a document proposing the merger of the two cities on either side of the River Irwell. He says: "Just as Buda and Pest merged to become Budapest, despite being separated by the Danube, the Manchester and Salford centre should be called 'Salchester'"
To me it sounds like something out of a 1950's film set in a bleak fictitious northern city, but they're serious about it. There's certainly something happening on the Salford side of the Irwell these days. Walking across Trinity Bridge (below), you'll see the framework of a massive new £20m office block being built for the Inland Revenue. And further up towards Trinity Church, a £1m department store is to open in the Brown Brothers building on the corner of Chapel Street and Trinity Way. There's also talk of more hotels and other prime developments along the "right bank" of the Irwell, turning it from the forgotten back yard of Manchester city centre to a new and pulsating part of the city in its own right. Still I'll believe it when I see it. I've seen "Venice of the North" headlines in previous years, and to compare the majestic sweep of the Danube as it passes between Buda and Pest to the rather unremarkable elbow of the River Irwell as it flows behind Deansgate, well, it's not comparing like with like. Manchester will never have as spectacular a setting as Budapest, and Venice will always have the edge over Salford for romantic appeal, but our two cities have a character of their own: gritty, industrial, but unique and unpretentious, and I think that part of their heritage should be maintained. The River Irwell is certainly looking (and smelling) a lot better than it has for many years, and the Manchester Ship Canal, though mostly empty of ships, is being steadily improved and developed. 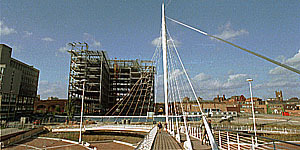 In the former Docks, construction of the Lowry Centre, a state of the art culture and exhibition complex, is continuing. And further down the "Big Ditch", at Dumplington, near the £600m Trafford Centre, currently being built, a distinguished Old Lady could become the star attraction there. Peel Holdings, owners of the ship canal, have put in a bid to purchase Britannia, the Royal Yacht, and moor it in an £8m heritage centre, which will celebrate the history of the canal and of Britannia. The advantages of the scheme will be that the grand old vessel will not be used as a casino, hotel or upmarket restaurant, as is the case with the other bids, but will be on display as a kind of stately home. Also, no lottery money will be needed. If the bid is accepted, the centre should be open by December 1999. So picture Manchester in five years time, from a helicopter flying from west to east - below us is the Ship Canal, and there to the right is the Royal Yacht Britannia - beyond it is the green dome of the Trafford Centre, with thousands of cars parked in the sprawling car parks. Next we're over Salford Quays, and below us is the futuristic-looking Lowry Centre with exhibitions about the famous Salford painter, as well as plays and films. Over to the left we can see a Metrolink tram crossing a bridge over the water, and further up are the plate glass office towers reflecting in the water - the brightly painted Trafford Swing Bridge looks better than it ever did during its working life, and as we follow the canal up towards Castlefield, we can see new housing developments around the Pomona Docks. Watch out for aerial views of Manchester in 1997, coming to this website very soon. After my little helicopter journey into the future, let's get back to the present again, with news of a new TV station run by Manchester United. The channel will operate for six hours per night on cable and satellite. As for terrestrial broadcasting, we're currently seeing the calm before the storm, I think, because digital broadcasting is about to transform television and radio. The BBC, celebrating its 75th birthday with a superb video of Lou Reed, and numerous other artists, singing his song "Perfect Day", may soon be fully receivable where you are. When television can be transferred via the Internet, which can't be very far off now, you'll be able to watch the excellent programmes of domestic BBC anywhere in the world. This evening, for instance, "Here and Now", broadcast live to the whole of the UK from Manchester, had a discussion about a pre-marital computer questionnaire designed to weed out prospective marriages likely to end in divorce. There was a transatlantic interview with the Rev. MacKnight in Washington DC, who defended the pre-marital checks in the face of the abrasive comments of the largely Mancunian audience. The impeccable Juliet Morris presided, holding the audience at bay in her measured southern voice. The second half of the programme was about problems in the health service, and featured hospitals and care homes in Manchester. These were the programmes I missed when I was an expat - but soon, whether you're in Albuquerque, Adelaide or Abidjan, you'll be able to see them - via the new media. In the meantime, if you're far from the UK, you'll have to get on a plane to see television from home, and what's the best airport to arrive at in the UK? You guessed it, Manchester! It was voted top UK airport in the recent Travel Awards, sponsored by American Express and Travel Trade Gazette. But don't expect your journey to be entirely problem-free. On Friday, a British Airways Shuttle on its way from Manchester to London was reported to have passed within two hundred feet of a Japan Airlines Boeing 747 cargo plane near London Heathrow. And today, hundreds of passengers arrived at Manchester Airport only to discover that the airline they have booked with had gone bust. Turkish based Sun Tours (no relation to Suntours Travel Manchester of Stevenson Square) ceased trading yesterday, causing distress among standed holiday makers in Turkey and disappointment for those due to fly on holiday from Manchester. As for the second runway, work is proceeding steadily, and this weekend, residents of Hill House, the 400 year old half-timbered house caught in the path of the runway, finally had to move out. Ambling down country lanes near Mobberley and Ashley these days, you go round a bend to find the road blocked by a wire fence - reminding me of east Germany during the Cold War. What a pity this corner of Cheshire will never be the same again, but that's progress. The police are confident they'll be able to catch those responsible. It's shocking to hear of such incidents, but I have to say I don't feel any more at risk at night in Manchester than I've ever felt. I've often been out in that area, which after dark is normally full of student night-club-goers, and have not felt in undue danger. Most people seem to agree that a heavier police presence, with more bobbies on the beat, would do a lot to stem thuggish behaviour in the city centre at night. Councillor Pat Karney wants to introduce laws to ban known troublemakers from the city centre for life. The idea is commendable, but the problem is enforcing it. The weather this week has been a familiar mix of overcast skies and drizzle interspersed with periods of sunshine. Temperatures have been around the 16/61 mark. Yesterday was sunny and very pleasant, but today, there was drizzle in the morning, which had cleared up by 3pm, when the photo of a Metrolink tram on Lower Mosley Street (left) was taken. This evening there were black clouds and heavy rain. By 10pm the rain had stopped and the temperature was cool.